Garrett EuroAce Metal Detector Review | How does It compare in 2018? What is the difference between the Garrett Euro Ace and the Garrett 350? The Garrett Euro Ace or Garrett ACE 350 is basically the same model of machine, one simply is designed for use in Europe and the other in the United States the only difference is the decal display and denominations. Now we know the difference, let’s talk about the EuroAce metal detector. It’s the 3rd in the series of the Ace metal detectors, you have the Ace 150, the Ace 250 then the EuroAce. This was my very first machine, and it served me very well! 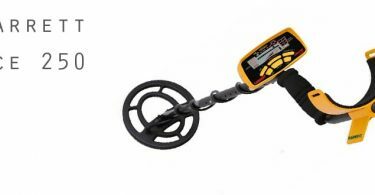 For someone starting out in metal detecting the Euro Ace is a fantastic, straightforward, no-frills metal detector that does the job, and does it well integrating a mid-range level of power and features but in a simple to use way. The Euroace has many positive reviews and has proven to be one of the most popular metal detectors in the UK finding its users many interesting coins, artefacts and relics. You’re not going to spend an age having to learn about how to use it, you can pretty much switch it on and go, and you should be able to use it effectively by the end of your first outing. The more time you spend using it though, the more you will be able to fine-tune your hunts when you are used to the sounds it makes and what they are telling you. As per past models the machine can be assembled with ease in just a few minutes without the need for tools or a degree. Upon Opening the box you will see the control panel, the stem and the coil and wire. These are all easily attached to each other and all clip into place nice and sturdily. The coil wire wraps around the stem nice and snug. The machine is comfortable in the hands, and very lightweight weighing just 1.27 kgs. It features the forearm sponge padding which straps to your arm via the velcro straps and a comfortable padded sponge grip. All in I believe that the Garrett machines are rugged and ready, and although they may not look that way largely due to the yellow design, all of the Garrett metal detectors that I have owned, have taken a battering and never failed me yet. Garrett Euro Ace Control Panel (European denominations displayed) The 350 will have cents and inches instead. There are only a few buttons, 6 to be exact, making this a very easy metal detector to navigate. No internal menus and no complicated setup process. It’s very straightforward. Mode – To toggle through the preset and custom search modes. Sensitivity – To increase or decrease the sensitivity of the machine. Discrimination – To amend the discrimination patterns. Power – To turn on or off the metal detector. Pinpoint – To enter the pinpoint mode. Accept or Reject – To accept or reject certain target patterns. The Euro Ace battery compartment can be found on the back of the control panel by sliding down the plastic cover. 4 x AA batteries are required. The battery life is usually around 20+ hours, so what I would suggest here is if you’re going to purchase a metal detector then spend an extra £20 odd on a battery charger and a set of rechargeable batteries. This will save you money in the long run and save you having to hunt around for new batteries before each hunt. I personally have 2 sets and always charge them the night before I am due to go on a dig. Custom search mode can be used to save your own custom search patterns and also allows you to tweak settings according to the ground conditions you are searching on. Zero mode is a new name for All metal mode, all metal mode will not discriminate against any kind of metals. So you will receive a signal for iron and such like, that being said this is the mode I mainly use, I do dig more scrap, but then I can’t bear the thought of missing anything and sometimes signals are iffy with all metal detectors depending on how the item lays in the ground. Once you are used to the audio you will know roughly what it is in the ground by the sound. Jewellery mode discriminates against most trash and small pieces of iron such as nails predominately designed for the location of rings and jewellery, Garrett claim to have fine-tuned the settings for this. Relic mode keeps the lower end of the conductivity scale making sure you don’t miss out on bronze, brass copper etc but discriminates iron. Coins mode discriminates iron, foil, ring pulls (be careful with this as hammered silvered coins can show as ring pulls) designed for coin shooting. The simple LED screen is present and it’s easy to read, there is a depth indicator up to 20cm, ferrous to non-ferrous display, battery levels, it shows the mode selected display, the sensitivity settings bar and the discrimination notches selected. 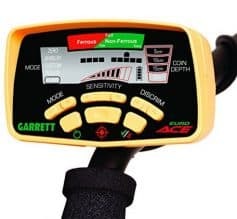 Often said that the ACE 250 is the most popular Garrett metal detector I do believe now due to price decreases that the Euro Ace sells more frequently. You can fine-tune the iron discrimination which also separates the Euroace metal detector from its predecessors. The pinpoint mode is always a very welcome feature of any metal detector if you don’t know what the pinpoint mode does it allows you to accurately locate the target. It can take some time to get used to and you will need to find the “sweet spot” of the coil. You can also purchase the renowned Garrett Pro Pointer, or the Makro Waterproof pointer whichever you buy you will find them such a godsend, Majorly decreasing the time you spend locating the target. The Garrett Euro Ace frequency runs at 8.25khz increasing its power and accuracy in comparison to the Garrett ACE 250. It helps the machine to be more effective when picking up smaller targets and gold, but of course, you have got to walk over it to find it! Is the Garrett Euro Ace Waterproof? The Garrett Euro Ace has a waterproof coil but it is unsure just how waterproof the control panel is, it takes some light rain, I know that for sure, but I wouldn’t risk a heavy downpour. There are many covers available for a small cost for the control panel housing, you could even wrap in clingfilm if you were desperate which is something I did when I first started out. A range of other coils are available to purchase for the Euro ACE allowing you to achieve different things with each, For example, to gain extra depth and to cover more ground the Nel Tornado coil comes highly recommended. Make sure you look at the costs first and benefits a good coil can be just as expensive as the machine itself, sometimes it’s worth looking at upgrading your machine. You can find the Euro Ace both on Amazon and eBay where all of your purchases are protected and covered, I personally do the majority of my online shopping on these platforms now due to the protection. You get a warranty straight from Garrett for 2 years parts and labour. If you’re looking to buy a secondhand Garrett Euroace then you’ll often find them on eBay. We would always advise buying new so you’re protected by the guarantee. I personally have owned and used the Garrett Euro Ace for a couple of years and I found it to be very productive with great depth capabilities. It’s simple to use, and a metal detector that you can turn on and go saving you valuable treasure hunting time! It’s one of my favourite backup metal detectors and has found me hundreds of artefacts and coins. I’ve only ever found one gold coin in all of my detecting years and the Euro Ace was the machine that found it! A Vicky half-sovereign. It offers fantastic value for money if you are working with a budget and as I said holds its money pretty well so if you wanted to sell and upgrade you won’t lose a lot. It has all of the features and power you’re going to need. I still believe its a beginners metal detector because of the simplicity, but it definitely has the power of a mid-range. It’s also worth noting that when they designed the Garrett Euro Ace they took into consideration the conditions of European terrain and soils so it works very well on highly mineralised grounds and performs fairly well on beaches. As per a lot of Garrett machines, it struggles a little bit in the wet sand with false signals, just keep your sensitivity low. 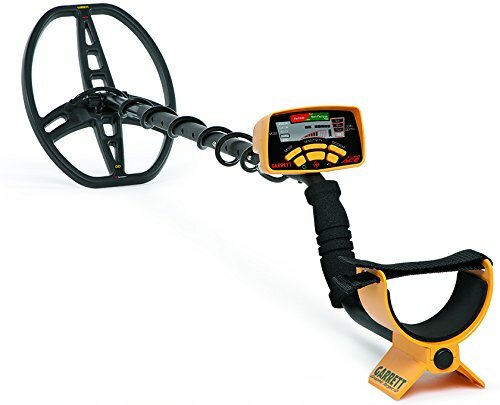 So if you’re looking for an all-around metal detector then it’s more than sufficient in most conditions and it’s a great price. There is a lack of volume control on the internal speaker of the detector which is a little annoying and if you use without headphones I do find it to be slightly loud and obtrusive. You should, however, receive the Easy Stow headphones as standard with the purchase of a Garrett Euro Ace and these do have volume control. Keeping the simplicity of the previous models in the ACE line of Garrett detectors the Euro Ace is a mid-range machine which can be used by both beginners and seasoned detectorists and has proven itself to be highly productive and a reliable machine. In my opinion, there is not much difference between the two price wise with the 400i being a little bit more expensive. They run on slightly different frequencies with the 400i running at a higher 1okhz opposed to the Euroace running at 8.25khz. The only thing I think I preferred with the 400i over the Garrett Euro Ace was the numeric display and Iron Check feature. If your budget stretches a little further then I would probably go for the 400i even if it was just for the numeric target ID. There’s also a pretty hand iron check feature on the 400i. You can download a copy of the Euro Ace owners manual in PDF format from here. Garrett Euro Ace Forum – Discuss settings, showcase finds, chat with other Euro Ace users. Please note these settings are of my own personal opinion and they highly depend on the conditions of the ground you are searching on. If you would like to submit your best settings for the Euroace then please leave a comment below. I found the best settings for the Garrett Euro Ace on pasture or ploughed land as follows: 1 bar from the top on sensitivity and in zero mode. However, if the ground is highly mineralised or trashy then try the relic mode with the sensitivity set to the same. If you are on dry sand crank the sensitivity all the way to the top and run the detector in zero mode. Wet sand can be a little more temperamental so if the machine becomes unstable decrease the sensitivity until the Euro Ace stabilises.